This unpainted Kleb Zellock first shot from the proposed second series of Droids figures, is surely very close to how the figure would have appeared had it gone into production. Like a production figure, its injection-molded and the torso consists of two seperate halves which, rather than being sonic-welded, are glued together at the seam. 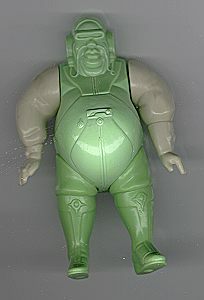 Kleb appears to have been cast in the appropriate color plastic for production, as the green of the main body portion closely matches the color-scheme of the figure as it was depicted in the 1986 Toy Toy Fair Catalog. As is the case with many first shots, the figure lacks production stamps.